It’s time for our regular look ahead to what’s happening in Emmerdale this week. Emma Barton looks like she’s here to stay and this week we see more of her true colours. Debbie is still unclear as to why Pete doesn’t want her around, but she finds out when Finn offers to babysit and then gets called away and Emma steps in. When Pete sees that Finn isn’t where he’s supposed to be and hears that Emma has been left in charge he runs home in a panic. Later, he confesses to Debbie what went on with Emma and Ross all those years ago. He’s left in turmoil that he might have to tell his brothers the truth and hopes instead that Emma will just leave the village. Emma isn’t happy with Pete and tells James what happened. He attempts to talk to Pete, maddening Emma in the process and she confronts James at the Farm. They argue bitterly whilst James is fiddling with some machinery and not paying attention to the hoist he’s just rigged. Emma lashes out causing the pallet to crash down on James and pin him to the floor. Emma checks, and he’s not breathing, but rather than phone an ambulance, she walks away leaving him to die. Will she change her mind and go back and help him? Last week we were hit with the surprise return of Rachel and the revelation that Jai had paid £40,000 for a child that he thought was his son Archie, only to be told by Rachel that she has the real Archie. It’s left Jai reeling and already disowning the fake Archie, whilst Meghan’s maternal side has kicked in. She snatched fake Archie and holed up in hotel, but it’s not long before the police swoop and she’s forced to spend the night in a cell whilst fake Archie is given over to social services. When she gets back to the village she is disgusted at Jai’s total lack of interest in ‘their child’ as all he wants to do is get Rachel to let him see the real Archie. Could it be a short lived marriage for the newly weds? Robert suggests to Aaron that they spend another night in a hotel together and Aaron jumps at the chance. 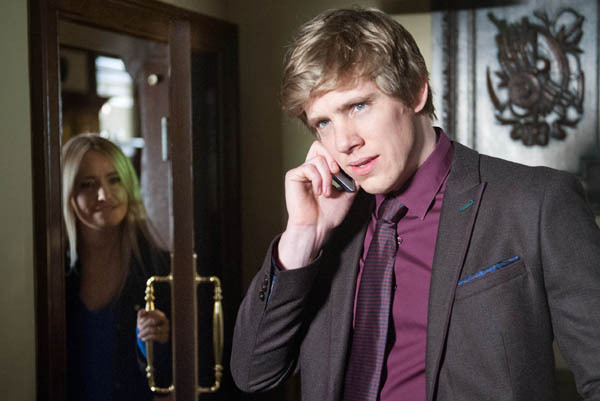 What Robert doesn’t realise is that Katie later overhears him on the phone to the hotel and is convinced she’s finally got him and that her and Chrissie should follow him. As Katie and Chrissie arrive at the reception, they find no one checked in under Robert’s name, but they spot his car in the car park so head back in to track him down. Oblivious to the fact that he’s minutes away from being caught, Robert joins Aaron in the hotel room. It’s not until he looks out of the door and sees the pair that he realises the danger and hastily makes a phone call to try and stop the pair in their steps. Will he get away with it or will the love affair go public? Nicola visits the doctors and is gobsmacked by what she’s told. Belle helps throw a party for Zak and Lisa, but Chas is worried about her lack of energy and enthusiasm. Kerry forms a plan to get Tracy out of Sam’s life, but will she succeed? Laurel avoids a kiss from Marlon to cover up the fact that she was drinking the night before.